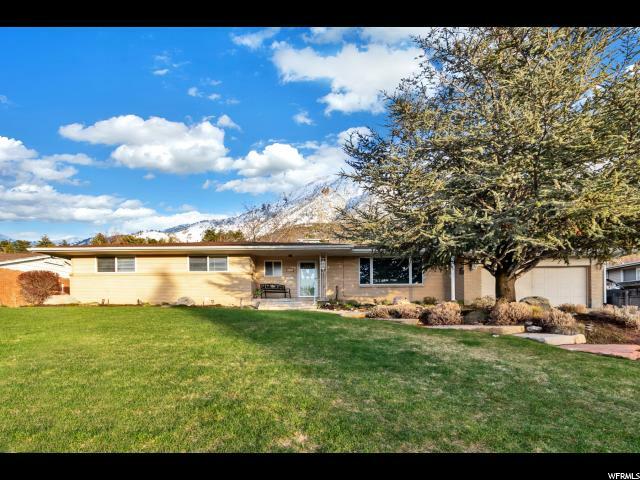 All MT OLYMPUS HILLS homes currently listed for sale in Salt Lake City as of 04/20/2019 are shown below. You can change the search criteria at any time by pressing the 'Change Search' button below. "BEAUTIFUL HOME IN OLYMPUS COVE / CUSTOM CABINETS & GRANITE COUNTER TOPS / HARDWOOD FLOORS / DESIGNER HARDWARE, LIGHTING & FIXTURES / LARGE LIVING SPACE / 2 GAS FIREPLACES / LARGE FAMILY ROOM / FRESHLY PAINTED / COVERED PATIO / VIEWS / PERFECT AND READY TO MOVE IN"
"Oly Cove stunner! This fully finished rambler has had an impressive array of updates done, and its ready for you to move in and call home. High quality kitchen cabinets and granite counter tops, double ovens, countertop range, recently remodeled bathrooms, updated windows, beaming hardwood flooring and brand new carpet are just a sampling of the list of features you'll find here. Did I mention this rambler is west facing for cool summer night bbq's under the covered porch, with the sound of the babbling waterfall and views of Mt. Olympus as your backdrop? The basement even features a vintage wet bar/kitchenette! Schools in the area are rated top notch, and amenities nearby include grocery shopping, retail, restaurants, and easy freeway access. Sure to sell fast! No showings available until the open house on Saturday, April 20th! "